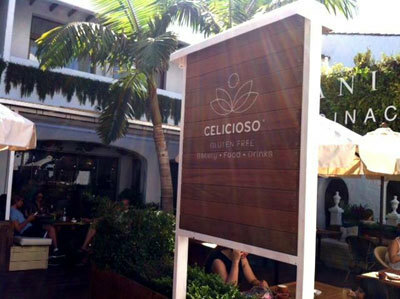 Marbella’s very first gluten free restaurant, Celicioso, opened its doors in July at the luxury Puente Romano Beach Resort & Spa, Marbella. Situated by the Roman Bridge which gives the resort its name, Celicioso enjoys the buzz of the hotel’s traditional Andalusian Square next to the shops and trendy restaurants at the Plaza Village. Celicioso is the ultimate choice for guests looking for a gluten-free dining option, whether due to intolerance, or simply as a health preference, this new dining concept serves an interesting range of delicious meals at breakfast, lunch and dinner from 10am until midnight each day. For guests wishing to dine-in, there is also a take-away delivery service available. In the evening, gluten-free cocktails are served on the restaurants magnificent covered terrace. Following the success of Celicioso Madrid, pioneer and owner of Celicioso Restaurants, Santiago Godfrid, decided to expand and introduce gluten-free to Marbella. The inspiration for Celicioso was born out of a desire to create tempting gluten-free food after Godfrid himself was diagnosed with coeliac disease aged 23. The owner is delighted he has been able to break down the barriers preventing sufferers from enjoying their favourite foods. In the spirit of creating gluten-free options for everything, Celicioso’s original baked goods menu will expand to encompass a savoury menu and drinks, including juices and cocktails. Santiago Godfrid commented, “We wanted to increase our offer to satisfy all the requests from our clients and to continue growing and working hard. Our new concept will be called Celicioso – Gluten Free – Bakery, Food & Drinks Marbella”. The opening of Puente Romano Beach Resort & Spa’s ninth restaurant, Celicioso, adds to the wide selection of dining options available as well as ensuring that the resort caters to every preference. The resort has already established itself as a culinary hotspot boasting two restaurants from Michelin starred chef, Dani Garcia and the hotel’s popular global cuisine restaurant, Sea Grill. Puente Romano Beach Resort & Spa, member of The Leading Hotels of the World, is situated on the southern coast of Spain in the Costa del Sol within the magnificent “Golden Mile”, a luxurious residential area between Marbella and Puerto Banus, just 35 minutes’ drive from Málaga Airport. Resembling an Andalusian village, the 264 luxurious Mediterranean style guest rooms are spread in 27 three–storey villas, among 55.000 sq. m. of lush, sub-tropical gardens, cascading down to the Mediterranean Sea. Over 400 species of plant life have been brought to the gardens from all around the world. The resort is evolving its brand and facilities to further enhance its image as the leading luxury beach resort in Marbella. An extensive multi-million Euro refurbishment has comprised restaurants, rooms, suites and common areas, and the renaming of Puente Romano Hotel to Puente Romano Beach Resort & Spa, Marbella. The exciting project will continue throughout 2015. Puente Romano Beach Resort & Spa features, spectacular designs by acclaimed interior designer, Andrew Martin, unprecedented cuisine and nightlife with 9 restaurants, including the 2-Michelin Star Dani García Restaurant, contemporary amenities, sea front and garden pools, a world renowned Tennis Club, 18- hole golf course and an Equestrian Centre. For more information, visit puenteromano.com.